Quartzsite, Arizona is a sleepy town of 3,700 people. It gets really hot in the summer, and most of the year it's little more than a stopover on I-10. 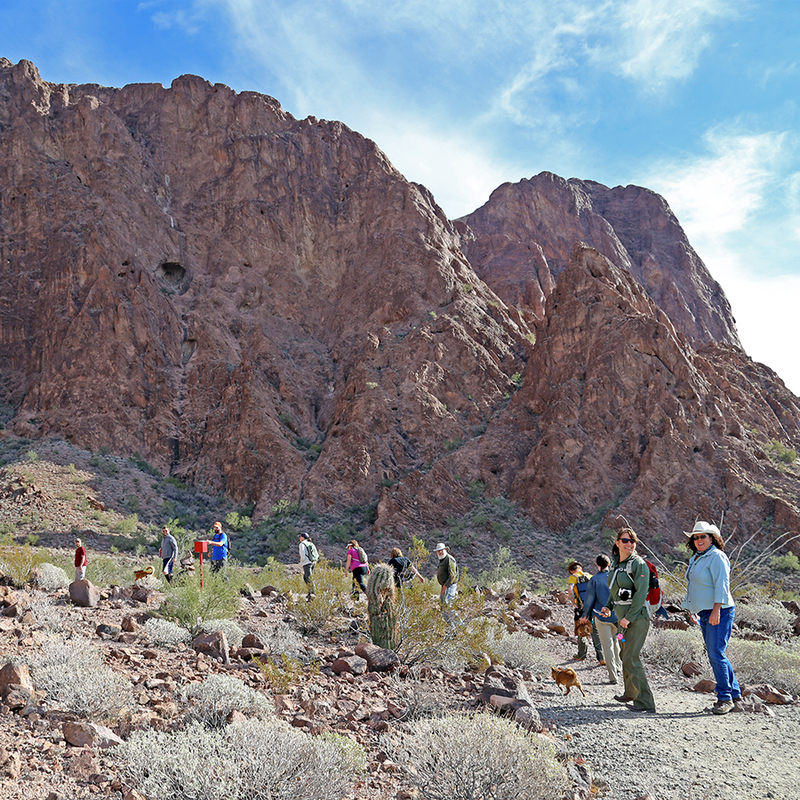 But in January, Quartzsite is bursting at the seams with tourists. RVers and gem-lovers come from all over for the town's annual RV show and gem show, which attract a total of 1.5 million visitors annually. Curious to know what the fuss was about, we made our way to Quartzsite in January 2016. What we found was a bit of a madhouse. 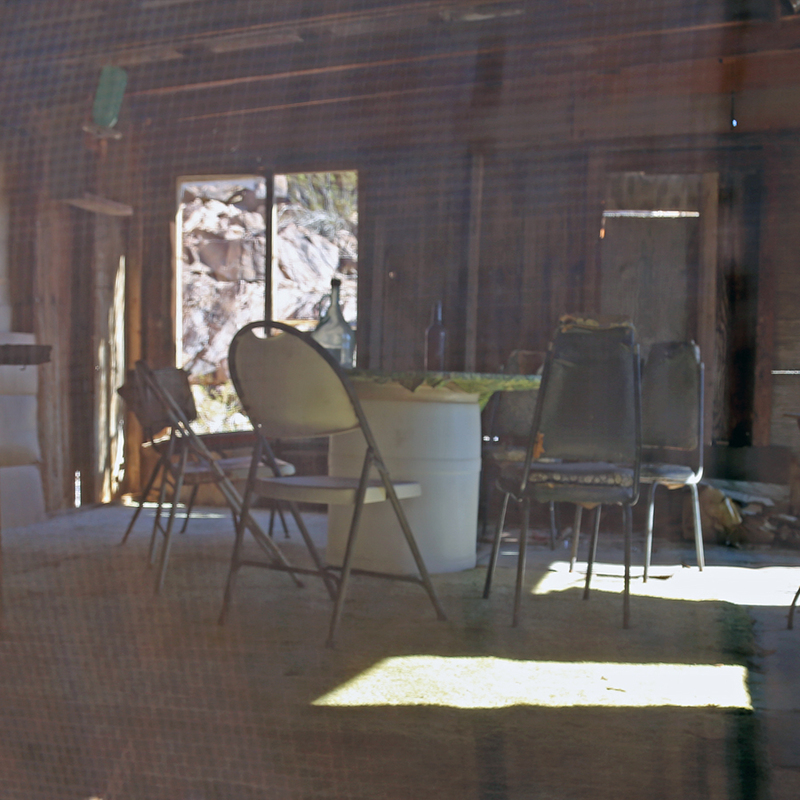 While shoppers can find some interesting buys at the RV show, though, we found the charm of Quartzsite lay elsewhere. 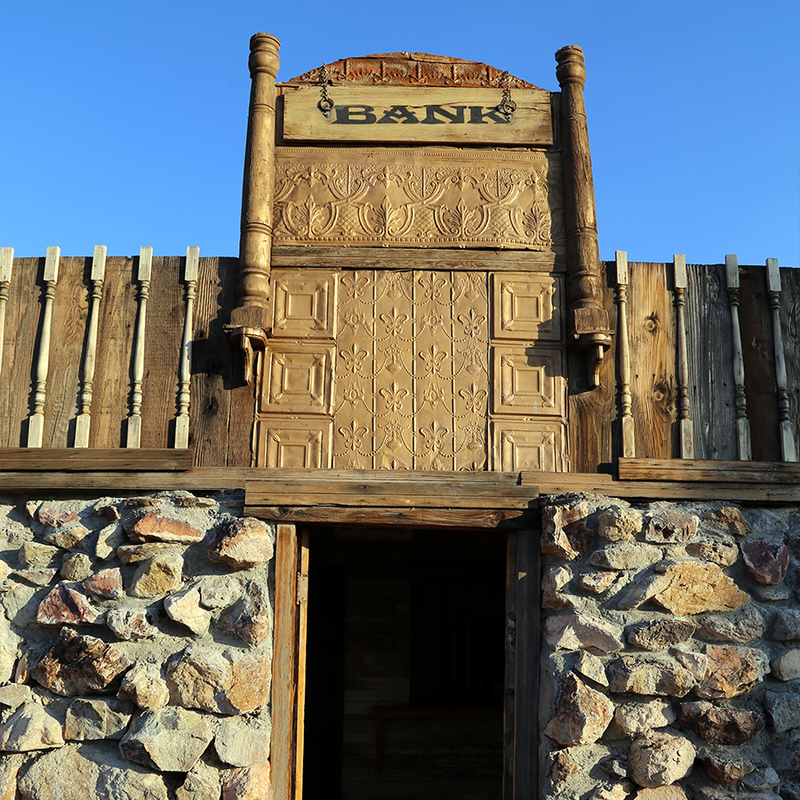 Here are 5 things to do when you visit Quartzsite other than pushing your way through the crowds. 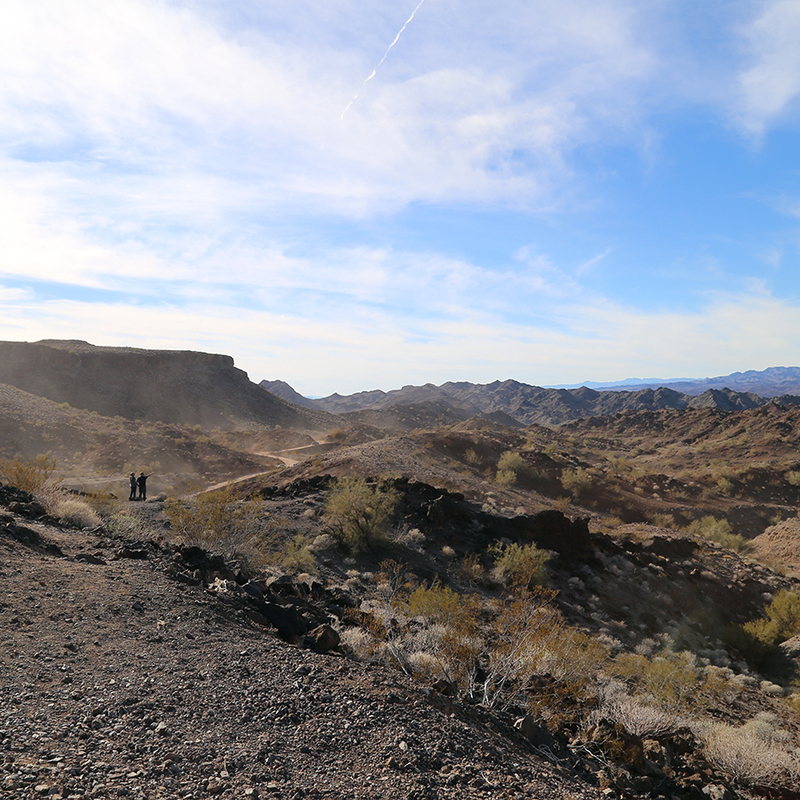 We boondocked at Kofa National Wildlife Refuge, about 12 miles outside of the town, and we found a fantastic hiking trail right in our backyard: Palm Canyon. 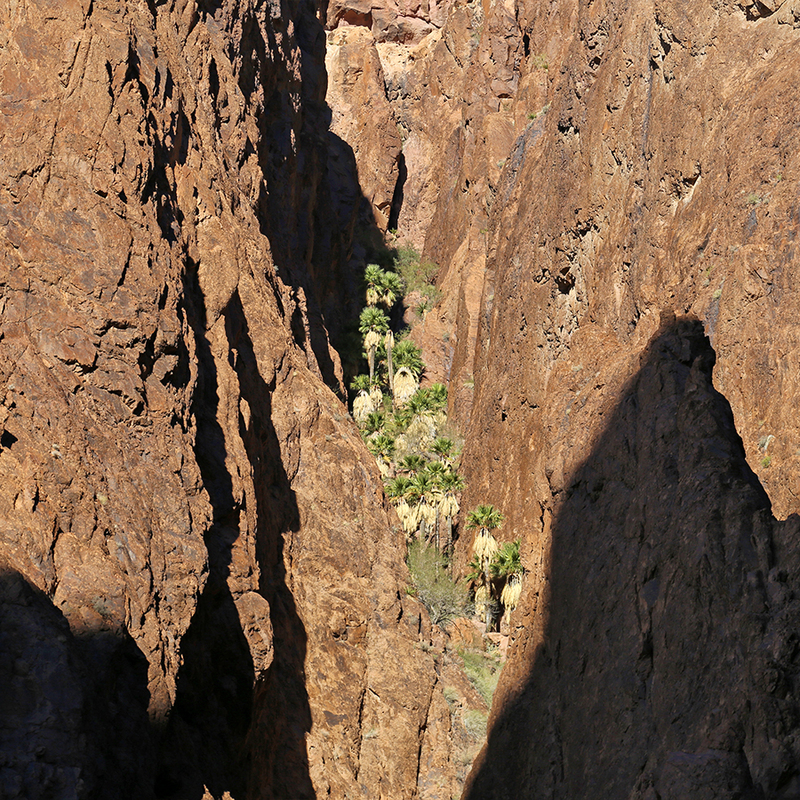 Some of the only palm trees native to Arizona thrive in the dark crevices of this canyon, illuminated by the scalding sun in the early and mid-afternoon (at least in the winter). The view from inside the canyon of the surrounding landscape is beautiful, although it narrows the farther up you go. Designated as moderately easy, there is an opportunity to keep climbing after the half mile trail officially ends, but it gets increasingly challenging and rocky and doesn't really lend itself to any better views, that we could find. It's definitely worth a visit. 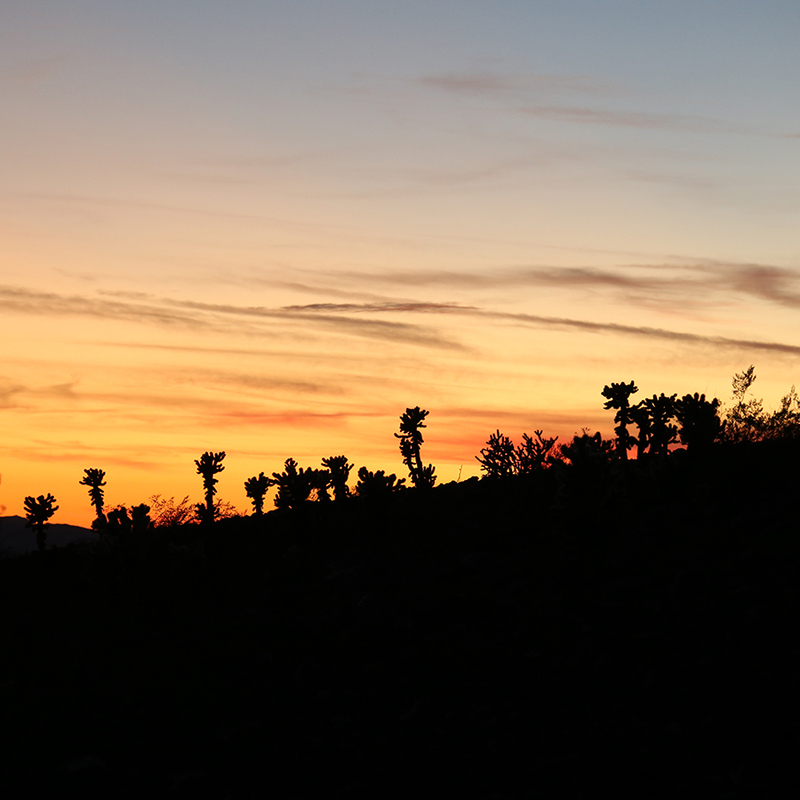 If you're willing to take a drive, another great hiking, climbing and bouldering mecca not terribly far away is Joshua Tree National Park, which deserves its own dedicated post. If you have an off-road capable vehicle, opportunities to go exploring will be everywhere you look. 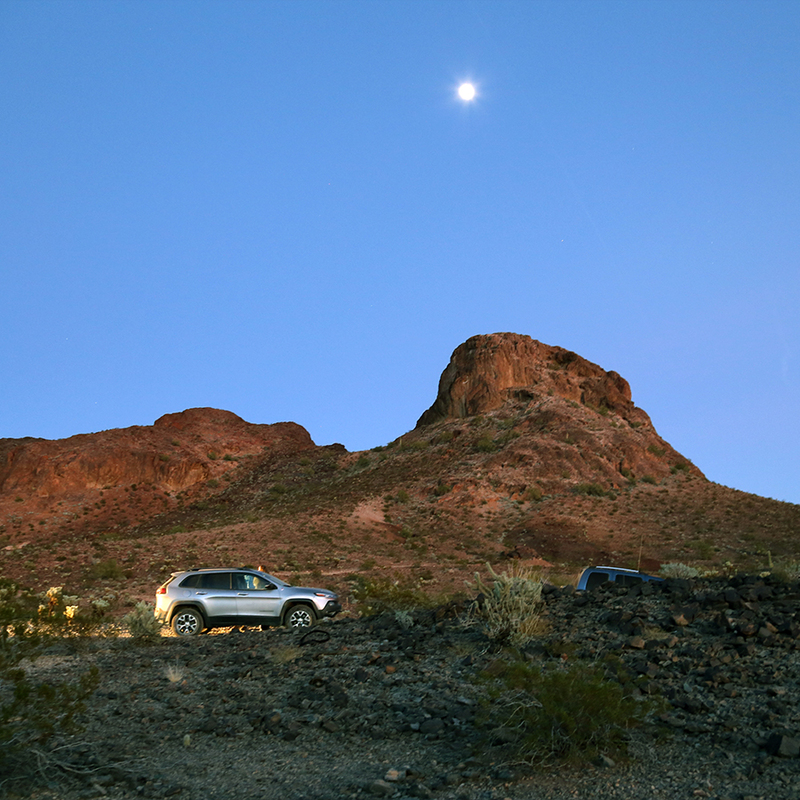 We had two off-roading outings: Burro Canyon and Plomosa Mountains. Both are recommended, although you should definitely bring a GPS with you, as there are several confusing points in the trails, and some extra water and food. The route for Burro Canyon can be found here, and Eric of JenEric Ramblings used this book to plan Plomosa Mountains and several other outings we didn't join in on. 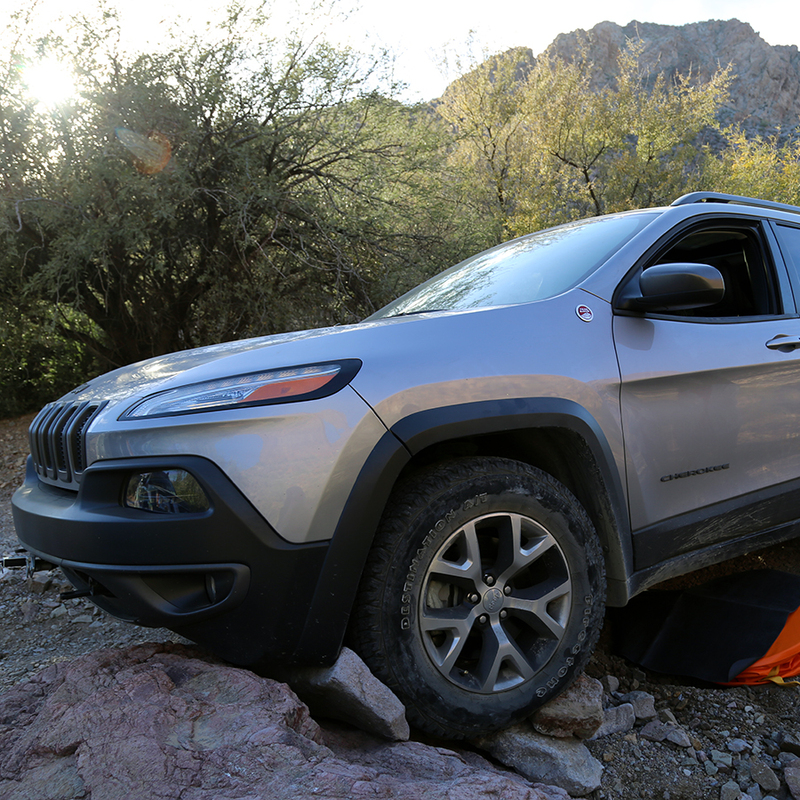 As the proud new owners of a 2014 Jeep Cherokee Trailhawk, we'd heard the car should be pretty off-road-worthy right out of the box. But we hadn't tested this theory yet. Josh was first to take her for a spin. Naturally, a "Get up on that rock; this shot is gonna be awesome!" moment turned into a "Oh dear, that rock's about to rip off your front bumper" moment. Luckily for us, Eric saved the day with an inflatable jack. A few days later, the Jeep took to the trails again, this time with both Josh and me in tow. We had a beautiful drive through the Plomosa Mountains that ended up with us getting only a little bit lost in the dark. Fortunately, we had friends with us once again to keep each other safe, and then to turn the whole experience into a great story around the bonfire later that night. 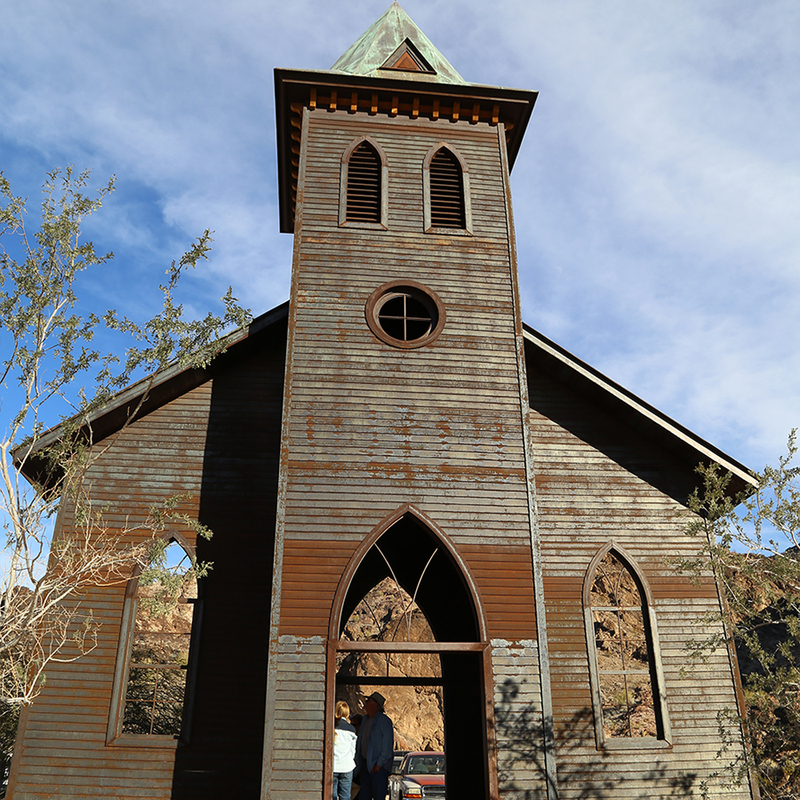 Because there is so much public land around Quartzsite, there's lots of opportunities for chancing upon cool stuff. Pick a road and drive down it. See what you see. Chances are it will include mountains, cool cacti, and maybe even something more amazing. In an afternoon of exploring with Anna of Small House Big World, for instance, we stumbled across a semi-active mine. The feeling we got from the place was "Visitors will be shot! Hehe, just kidding, come on in." While mining claims are still active here, there is nothing barring curious visitors from wandering around and taking photos. 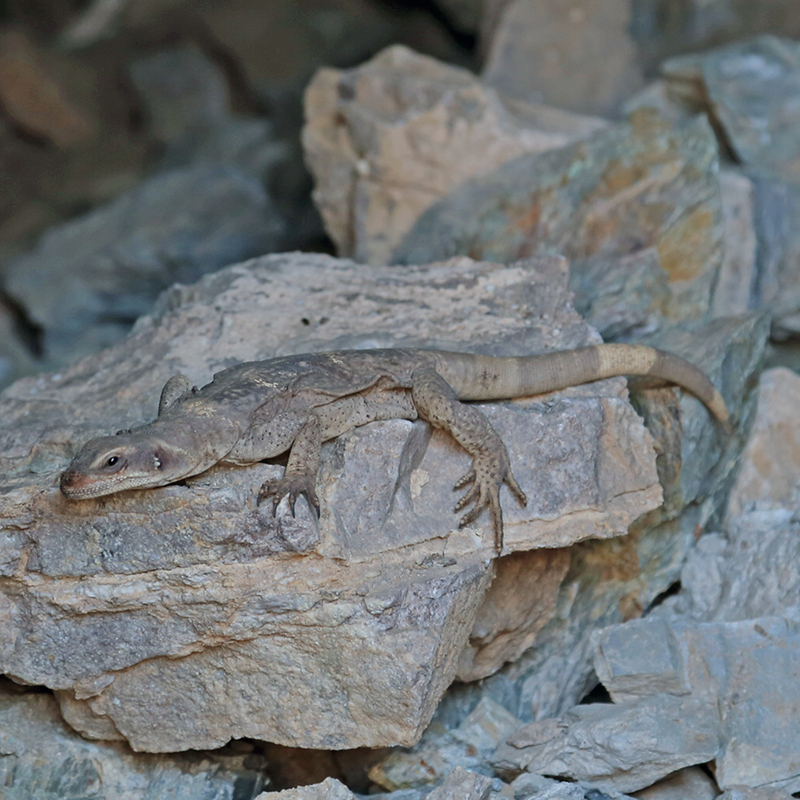 Anna even found a chuckwalla hiding at the edge of one of the closed-off mine shafts at another nearby mine. This may be one of those "The fish was THIS BIG" stories, but I remember this creature being a foot long. A definite go-see if you're in the area is the Castle Dome Museum. We weren't sure what we'd find when we arrived, but it ended up being a lot of fun. Be prepared for an off-road drive for several miles, although it's smooth enough that regular cars can make it without a problem. 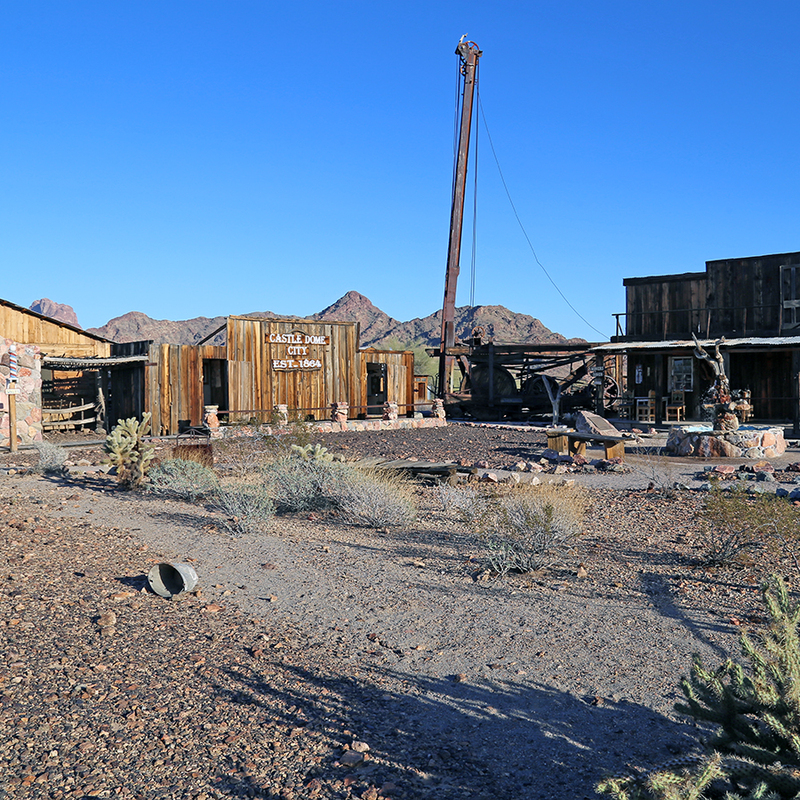 Castle Dome was settled as a mining camp in the 1860s, and prospectors couldn't have asked for a more quintessentially Wild West setting. 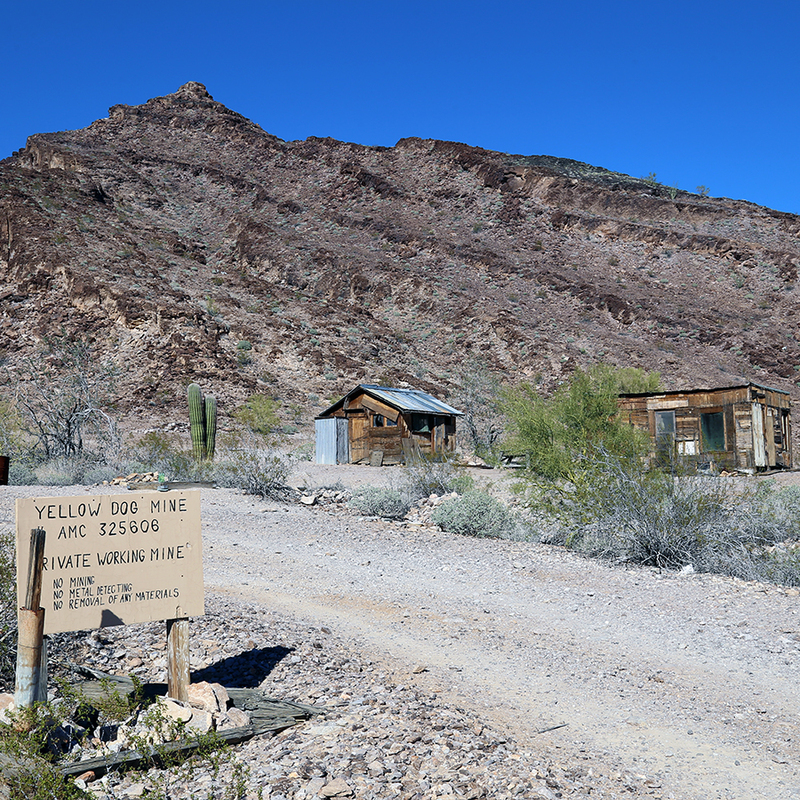 With a yard of cholla, a backdrop of ore-rich mountains, and sky that goes and goes forever, whole families set up lives here to make their fortunes. 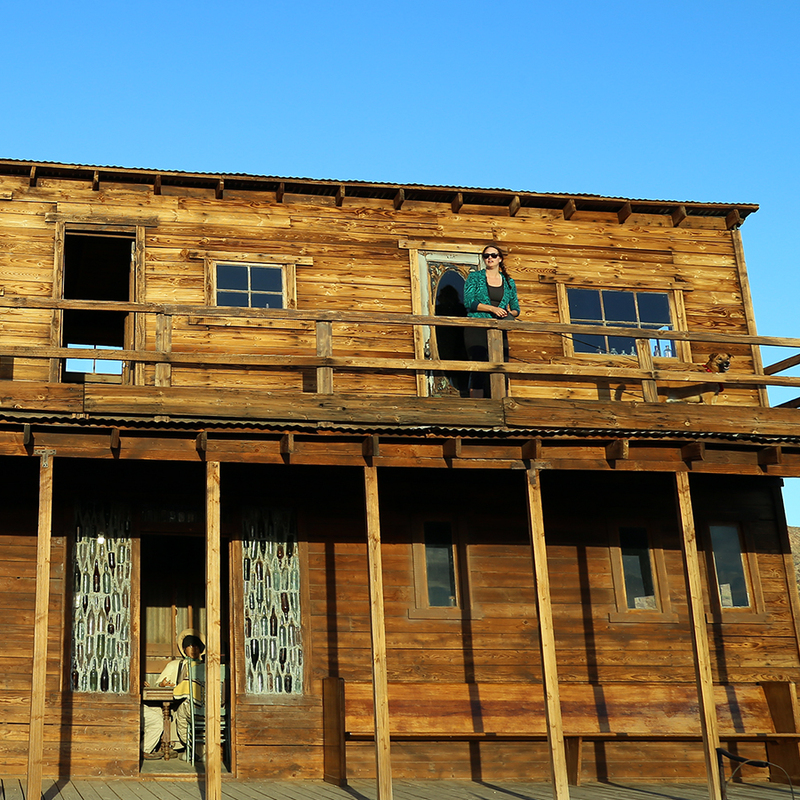 At its peak in the 1880s, some speculate the town had as many as 3,000 people. Its population declined to almost nothing but then had a resurgence in the 20th century, as mining for the war effort started up. 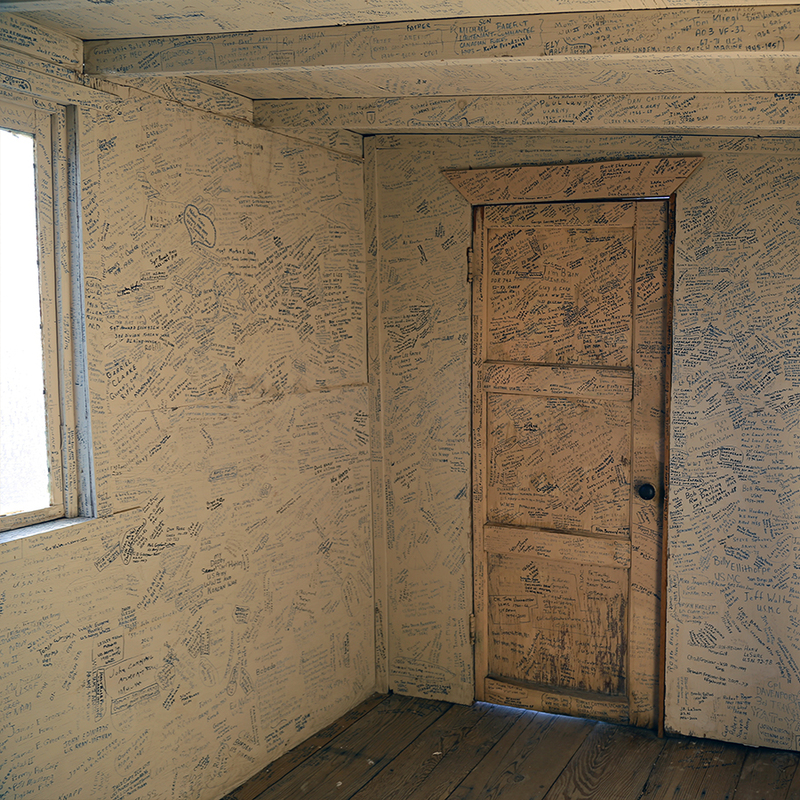 Following the tradition of World War II soldiers stationed here who wrote their names on this building, servicemen, servicewomen and veterans are permitted to leave their own mark. By 1978, Castle Dome was once again a ghost town. 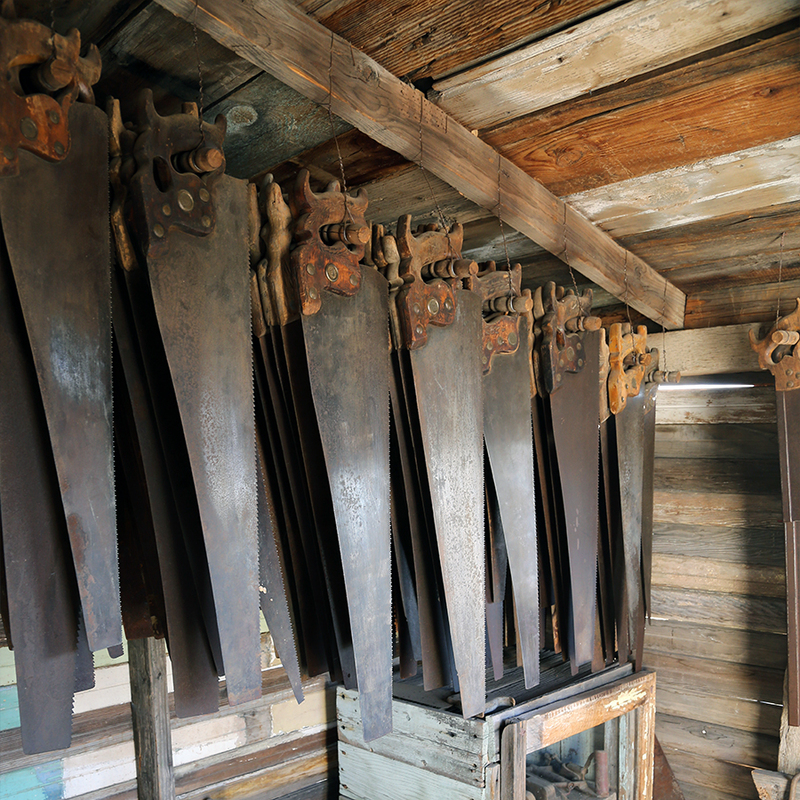 In 1994, the land was purchased and turned into a museum with 50 restored and recreated buildings. Fancy, right? How do you like the stair railing decor? It's a pretty kooky place (don't be startled by the period-dressed mannikins that are placed in still-life around the property), but definitely worth a visit if you love history and abandoned places. Bring $10 cash for your ticket. Our favorite in-town dining location was Silly Al's Pizza. We went a couple of times and enjoyed both meals. Be forewarned: they have a healthy karaoke night going on, so either get up there and sing your heart out or head to the back right corner to get some semblance of quiet. Tying Castle Dome Museum for the title of "kooky," though, is the Desert Bar. Only open on Saturdays and Sundays from 12-6pm (and only from October through April), make sure to check the schedule before you make the drive, because it's a bit of a commitment. You'll earn your supper on the way to this place, several miles outside of Parker, Arizona (although you might want to give your stomach a chance to settle before ordering). High-clearance vehicles will of course have no problem; lower cars might have to go slow, but we saw plenty in the parking lot. For off-roading fanatics, there is an alternate route in to the bar, but we were told that our Jeep Cherokee wouldn't have been high clearance enough to make it. 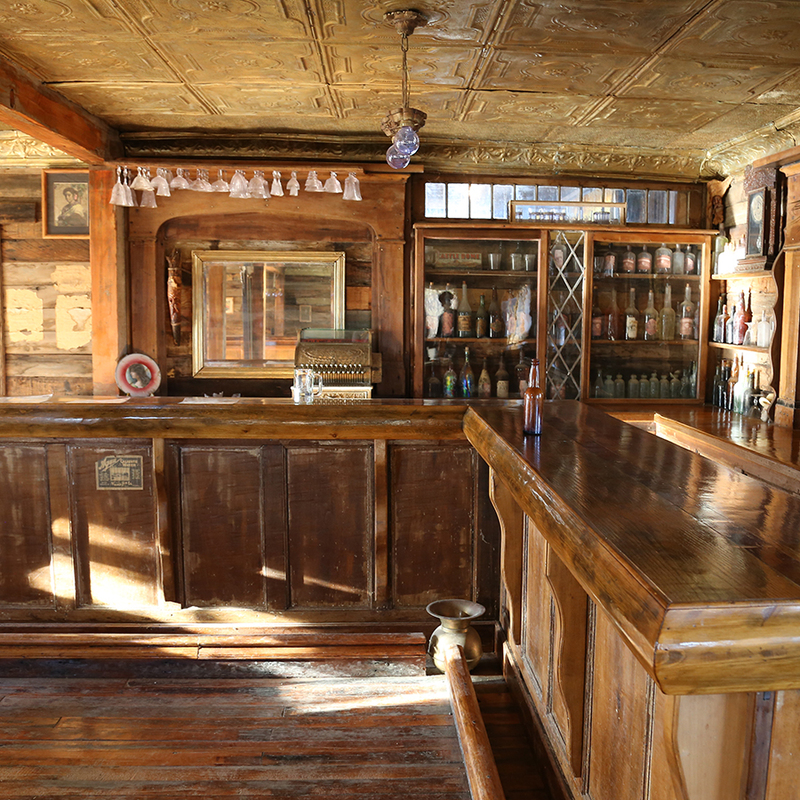 Far off the beaten path, the Desert Bar has no city water or electricity, and there's no cell service to be had. There are also no credit card readers, so bringing cash is a must. What there is is scenery, drink, food (surprisingly varied and good! ), music and a lot of people. 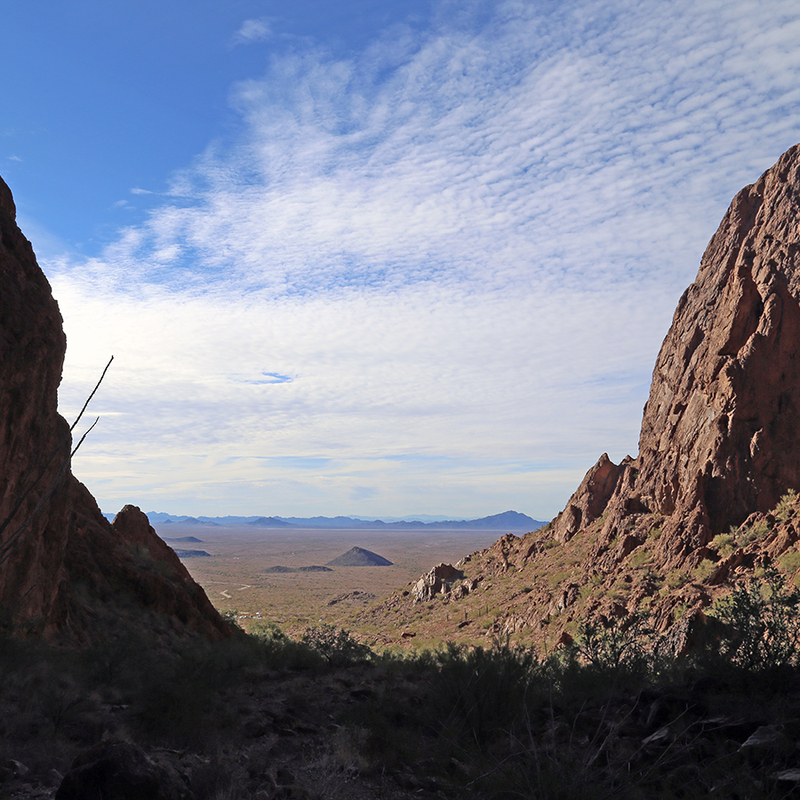 When Quartzsite itself loses your interest, turn your attention to the surrounding areas. 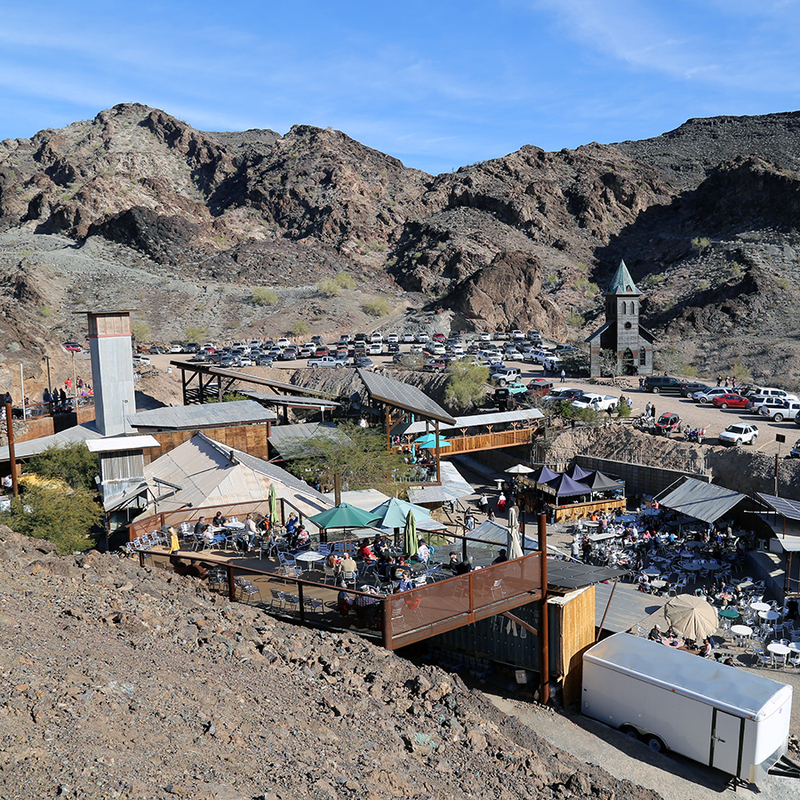 What other recommendations do you have for Quartzsite visitors, if you've visited?